Heat in the summer and cold temperatures in the winter affect blood pressure--the measure of the pressure of blood against the walls of the arteries--in a number of ways. Understanding the impact of temperature on blood pressure is vital to persons with hypertension or other blood pressure-related problems, particularly the elderly. Physicians recommend monitoring blood pressure levels and understanding the physical changes temperature may cause to maintain good health. 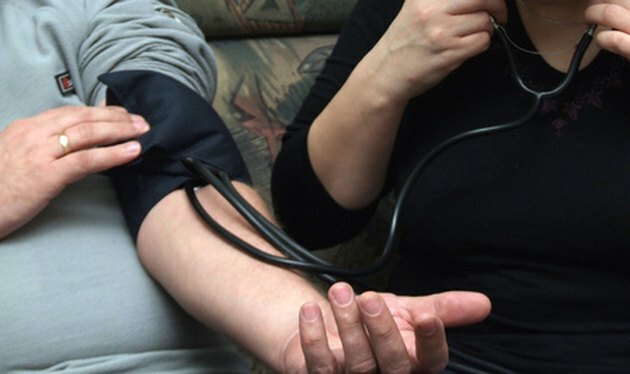 According to the MayoClinic.com, blood pressure increases in the winter and decreases in the summer in most people. The diameter of blood vessels constricts in cold temperatures, causing the heart to work harder to push blood through the veins and arteries. Both systolic (blood pressure when the heart contracts) and diastolic (blood pressure reading while the heart is at rest) readings increase during colder weather. Cold weather impacts the elderly more than other age groups. Physicians recommend older persons and those with chronically high blood pressure closely monitor their blood pressure during the winter. Cold weather may activate of the sympathetic nervous system, which controls how the body responds to stress, according to French research reported in 2009 in the "Archives of Internal Medicine." Lower temperatures stress the body, causing this system to activate the "fight or flight response." The body reacts with with a variety of symptoms, including pupil dilation, increased sweating, an increased heart rate, and increased blood pressure. Alternatively, high temperatures can trigger the "flight or fight response" by causing persons to sweat less or not at all. This also leads to increased blood pressure, according to The Merck Manual. If the cold or heat produces "flight or fight" symptoms, persons with hypertension may need to seek medical attention. High temperatures can cause blood pressure to plummet, just as it can make blood pressure rise. Water loss through sweating impacts the body in various ways, including decreased blood volume, low blood pressure, and rapid heart rate and falls. Physicians recommend monitoring the use of any drugs that effect sweat production. To combat dehydration, be sure to consume adequate amounts of water during exercise or any activity during which sweat is produced. Do Physically Fit Women Sweat More? Is it Better to Workout in the Cold or Hot?